You may have been inspired to start a vegetable garden, but just don’t know where to start. If you think your yard is too small, you’d be surprised how much you can get into a small space! 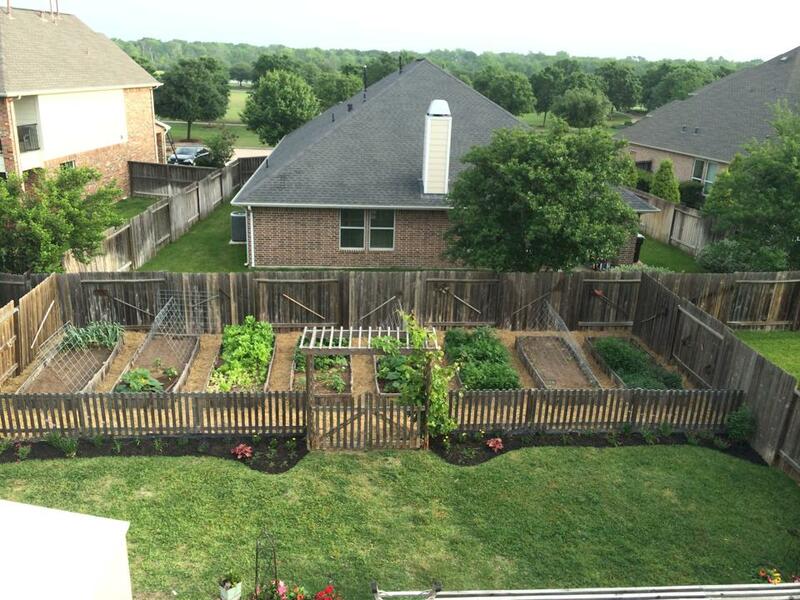 When we lived in Houston between 2011-2014, we had a tiny backyard, but Quinton put together a beautiful urban raised garden and we ended up having enough fresh vegetables and fruits for our family and plenty to share! Here are some simple steps to get started! 1. Start Small. You can always expand in seasons to come. If you start off too big, it may seem overwhelming and you might end up frustrated and want to give up. 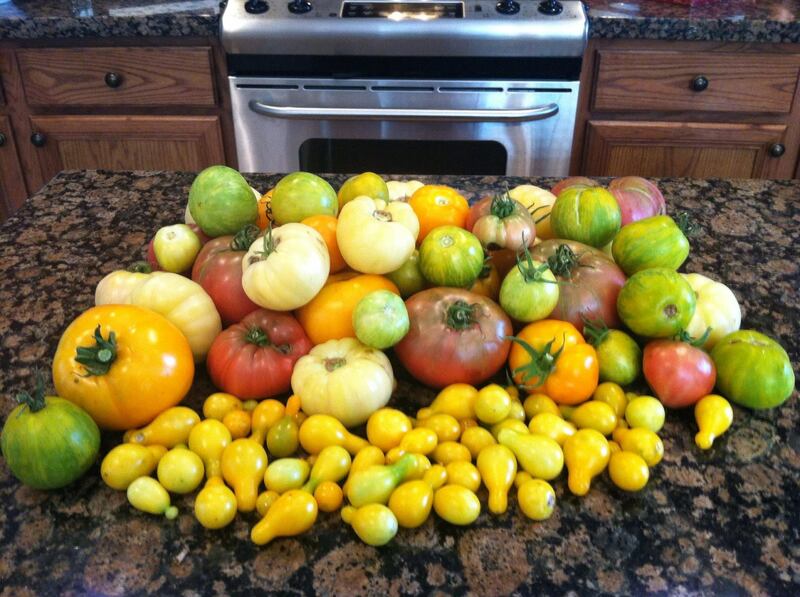 And hey, gardens are a lot of work, but very rewarding when it comes time to harvest. 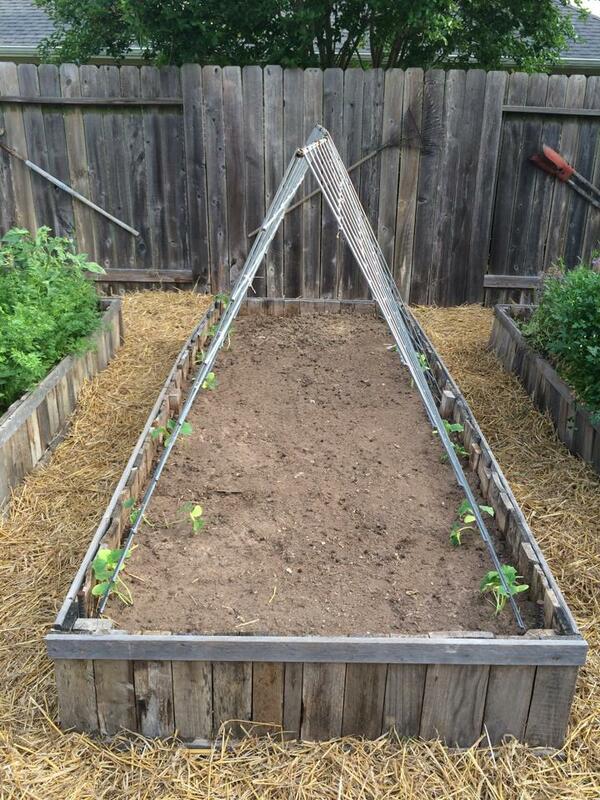 A good rule of thumb is to start off with an area of about 8’ X 8’ or 8′ X 10′ or try the 2′ X 8′ Raised Garden Bed Kit. After growing in-ground gardens and raised-bed gardens, we prefer raised beds because they are easier for us to manage. Weed control is much easier for sure. 2. Location, Location, Location. Choosing the right location is very important. You want to pick a spot that gets full sun throughout the day or at least 6 to 8 hours of direct sunlight. 3. Kill off grass and weeds. Once you’ve chosen your location, one of the best ways to kill grass and weeds is to wet the area and lay a plastic tarp or black plastic sheeting over the area and anchor it down with large rocks or stakes. Allow the area to bake in the sun for a few days before you remove the plastic. Once everything is yellowed completely, remove plastic and begin clearing the area by removing large clumps of grass roots and dead weeds by hoeing and raking. One of my favorite tools is a Hula-Ho , it’s perfect for this task as well as quick weeding. 4. 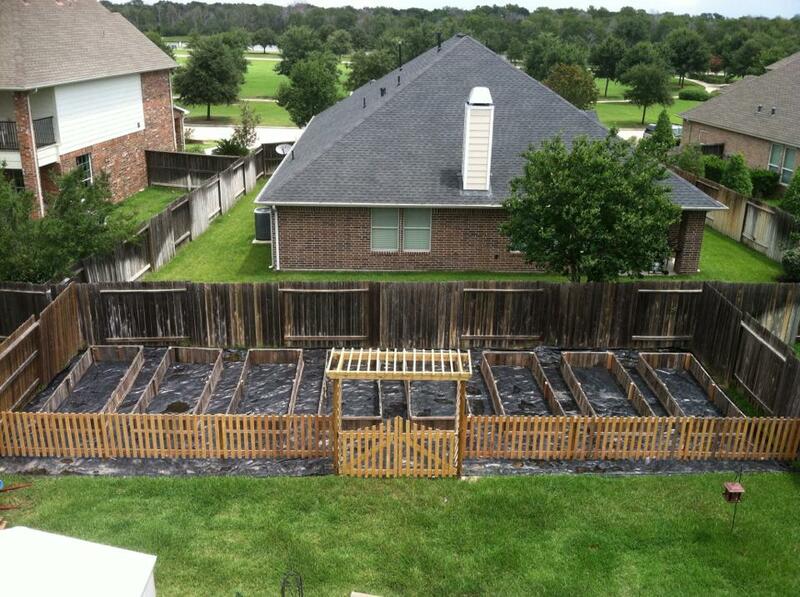 Start working the soil and building your beds. To get a great start, use a rototiller to get deep into the soil to fluff up the good dirt until it’s loose and crumbly. Don’t till if the soil is wet (I made this mistake once and it left me with major clumps of rock-like dirt that were next to impossible to break up.) A great tiller for the small home garden is the Earthquake MC43 Mini Cultivator, it’s lightweight, easy to maneuver and stores easily. Here’s how we did our beds in the burbs! 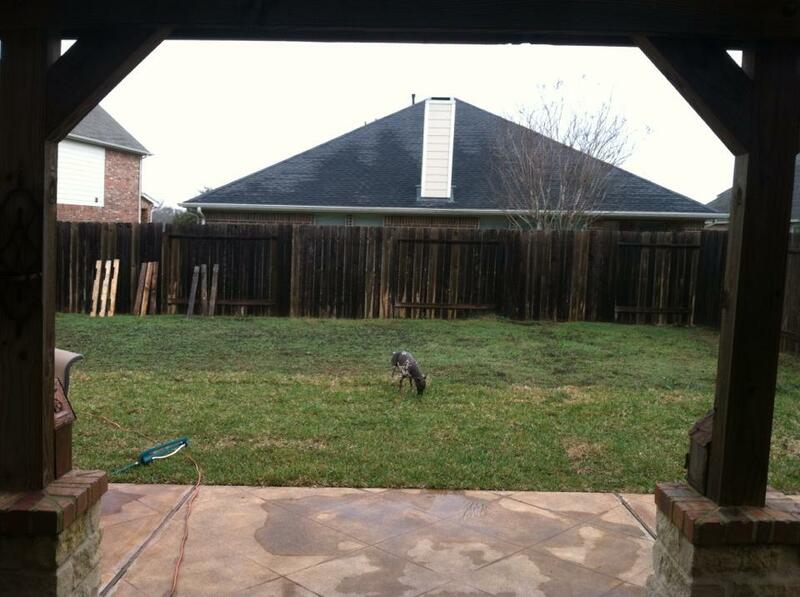 Remember we had a tiny backyard. 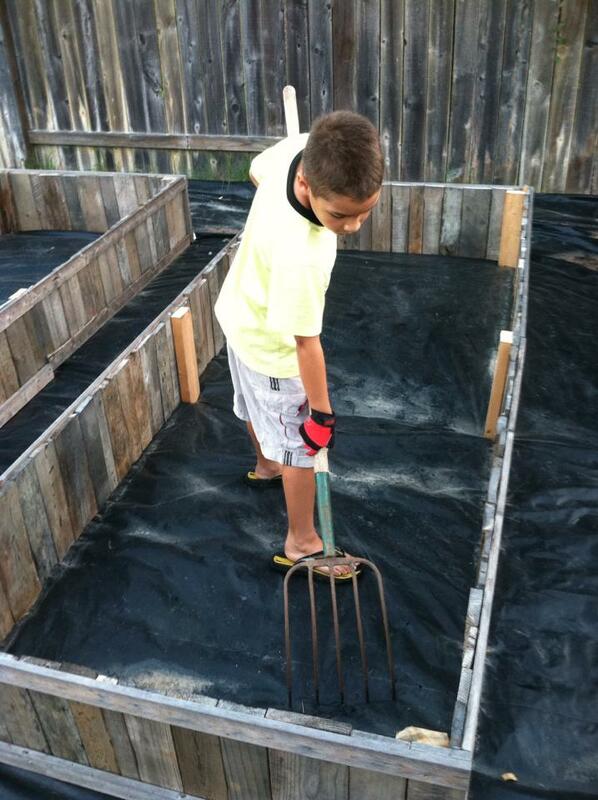 We laid black plastic down, placed the raised beds on top, and poked holes in the plastic with a pitchfork – inside the beds – for good drainage. Once the beds were filled with good garden soil, we amended the top 6 inches with rabbit manure for organic fertilizing. The good thing about rabbit manure is that is considered a “cold” manure, meaning it does not have to be composted for months before using. You can use it directly in the garden without harming your plants. “Hot” manures like chickens, sheep, horse, cows, and pigs must be broken down by composting for months before using, otherwise, the high nitrogen content of the “hot” manure will burn plants and roots and ultimately kill the plants. 5. Amend the soil by adding organic fertilizer, such as composted chicken or cow manure or use rabbit manure directly in the garden. Also, spread dry molasses , about 20 lbs. per 1000 square feet. You can buy dry molasses at your local feed store and it’s pretty inexpensive. Mine costs around $19 for a 50 lb bag. 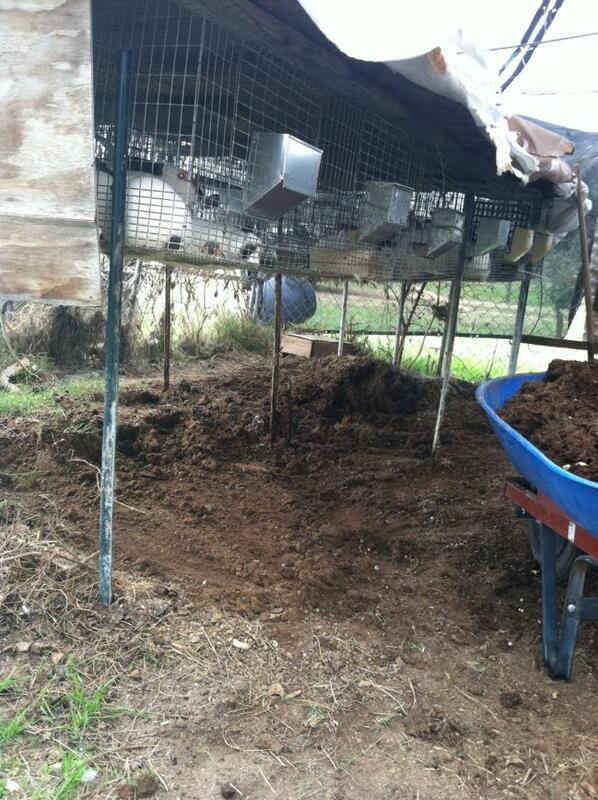 We found a local rabbit breeder, called them and asked if they sell their manure. She said we could have it free and as much as we want if we came and shoveled it and loaded it ourselves. Score! So, Quinton went over and got a pickup truck full. Since we garden organically, we don’t use any synthetic fertilizers, chemical pesticides, herbicides, fungicides or other harmful chemicals. Although organic gardening my seem complicated, it really isn’t. Once you learn about good practices, it’ll be a breeze. We have found some great organic fertilizers, pesticides and fungicides that are certified organic and have worked for us in our gardening. Garrett Juice is a wonderful organic foliar fertilizer to give your plants a healthy boost of nutrients. Cold Pressed Orange Oil is a great pesticide for organic gardening. We’ve had great success using Serenade Disease Control to help control black spot, powdery mildew, rust, gray mold, late blight and scab. Diatomaceous Earth is a fantastic organic “catch all” for pest control, rodent repellent, mite treatment, feed additive and more – a must have for organic gardeners! 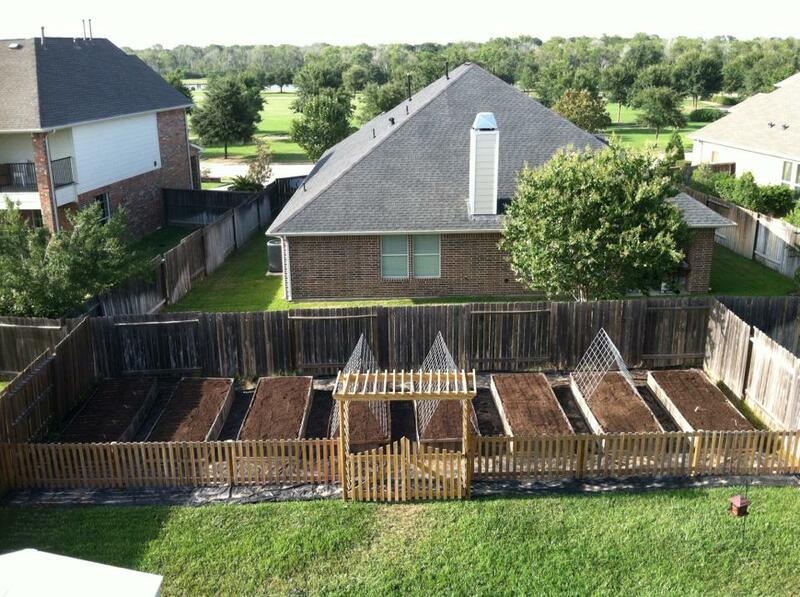 We live in Central Texas, and in our backyard we have dark black-clay soil. We have added organic materials such as compost, rabbit & chicken manure, hummus, crushed granite, and dry molasses to ammend our soil. 6. Plan out your garden design. Make sure to plant your tallest plants on the North side so they don’t shade other lower growing vegetables. That is, unless you are in the Southern hemisphere. So, if you’re reading this in Brazil, Australia or South Africa, you might want to do the opposite. A great online tool that I found and have used is http://www.growveg.com/, they have a 30-day free trial. This garden planning tool helps you draw out your garden plan and shows how to space plants. It really simplifies things for you. Then you can print off your new design, purchase your plants and head outside to plant your garden! Annual subscriptions are just $25 if you choose to subscribe. 7. Plant. I suggest buying plants at your local garden center for your first garden, but now a days you can also buy them online, which I have done and have been happy with the products I’ve received. Planting seeds can be time-consuming, difficult and frustrating for the beginner. Some nurseries carry organically grown seedlings. If you’re looking to purchase seedlings online, check out the Lawn & Garden section of my Amazon Shop for my favorites. 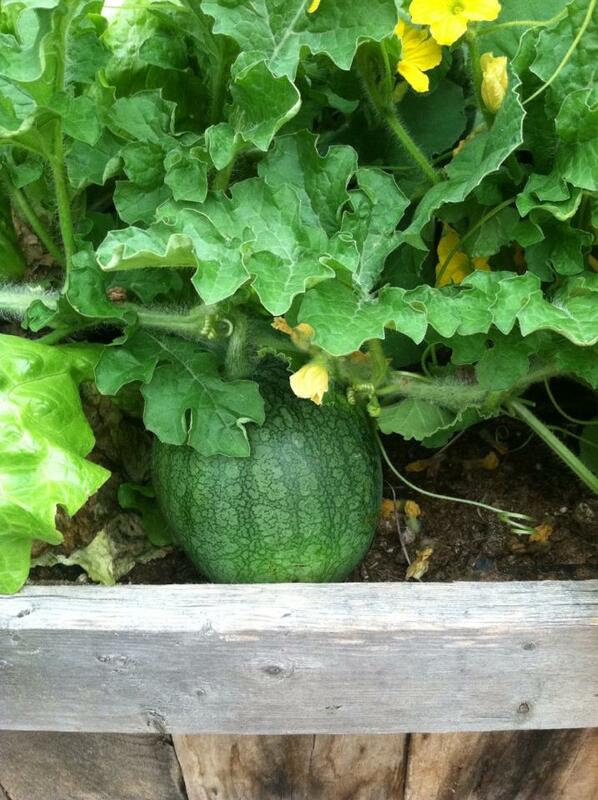 For a small garden, you may want to avoid large plant varieties like, pumpkin, corn, squash, watermelon and cantaloupe. 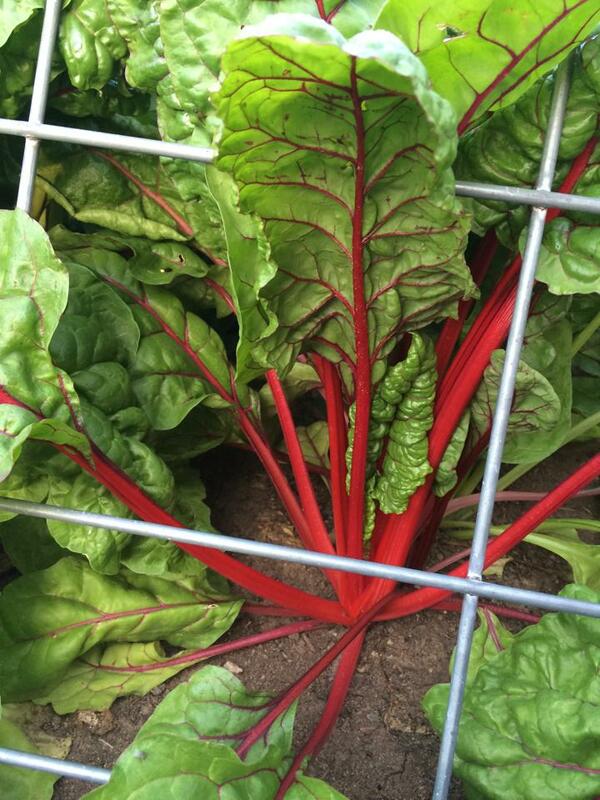 You may be able to plant some small varieties of these on trellises for a vertical garden. 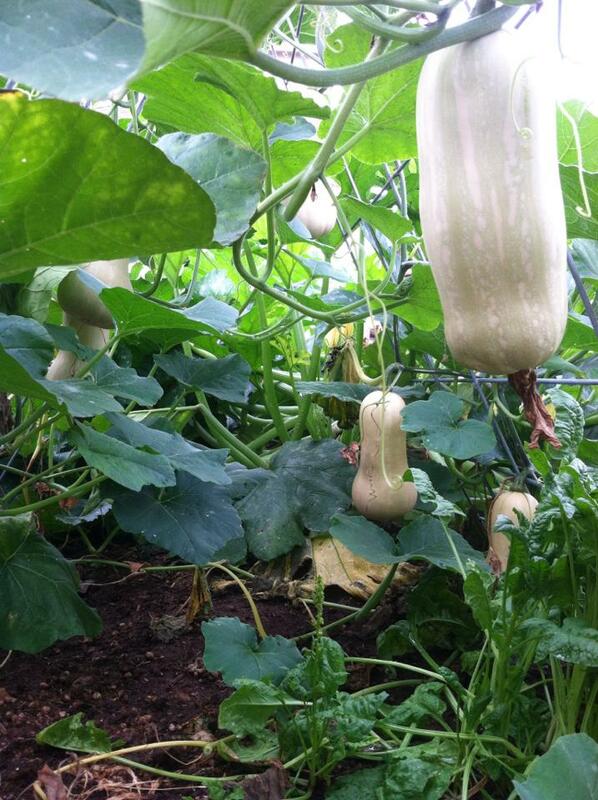 Small crops would include lettuce, radishes, tomatoes, beans, onions, peas, small zucchini and herbs. Because we had limited space, we chose a simple grid garden with long rectangular raised beds. We used 2 cattle panels, wired them together on top to make our “A-Frame” trellises. 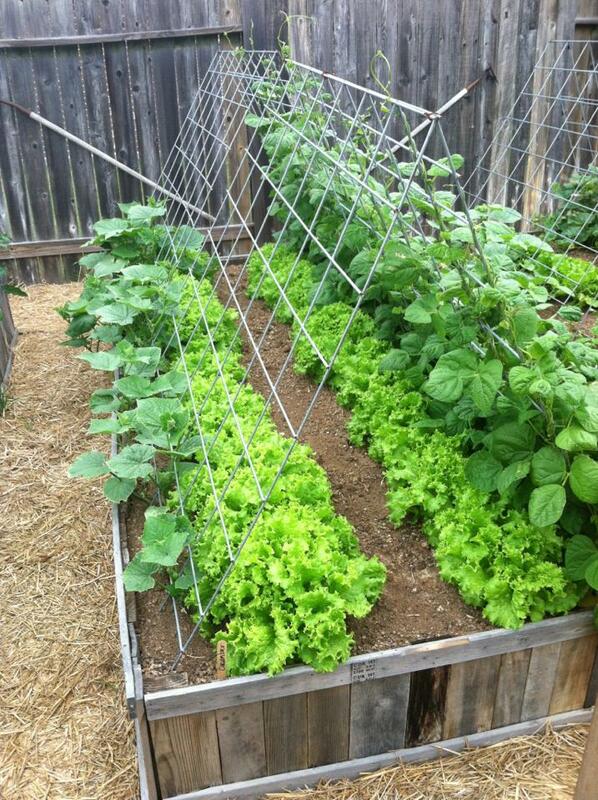 The great thing about using this type of trellis is that they are very sturdy, and you can plant underneath them. We chose to plant lettuces, spinach and swiss chard underneath them so that we could get a longer harvest out of these cooler weather plants. 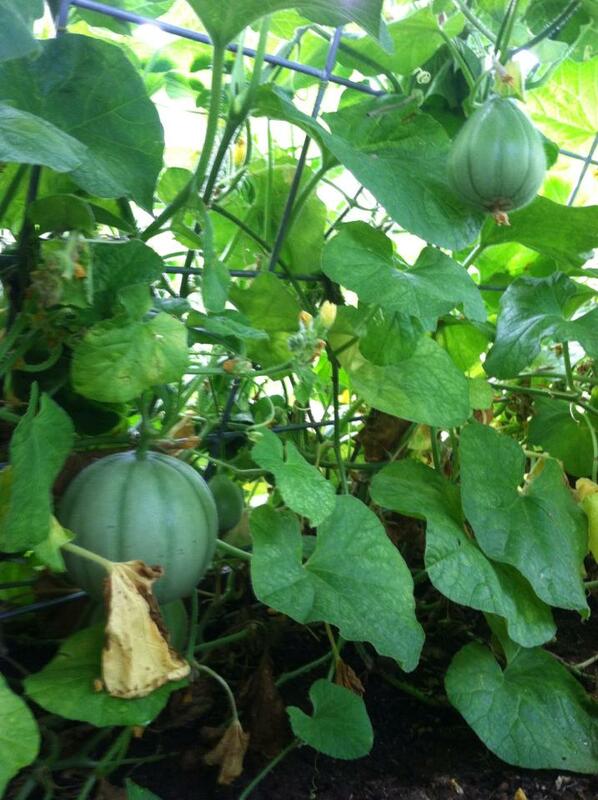 Once the beans, cucumbers, running squash and melons grew up the sides, they provided shade to the more tender plants underneath. Make sure to plant your Spring/Summer garden after all danger of frost. I visit the Aggie Horticulture http://aggie-horticulture.tamu.edu/lawn_garden/ website to find out all sorts of growing information, including average frost dates, as well as the number of plants to plant for my needs and hardy crops for my location. 8. Fence. Consider adding a small fence around the garden area, especially if you have young children or pets. a. Snails & Slugs: Sluggo ~ Kills snails & slugs yet safe for pets & wildlife! b. Insects & Pests: Orange Oil ~ Contains the raw oil collected from the citrus peel during the juicing extraction. No heat is applied during this “cold pressed” process thereby preserving the integrity of the oil. c. Animal Repellent: Deer Scram ~ Guard your valuable gardens, trees & shrubs from pesky browsing deer & foraging rabbits! Deer Scram is an organic, granular repellent that is best applied as a protective perimeter strip around flowers, plants and shrubs. This stuff really works! d. Worms & Caterpillars: Safer Brand with BT (Bacillus thuringiensis var. 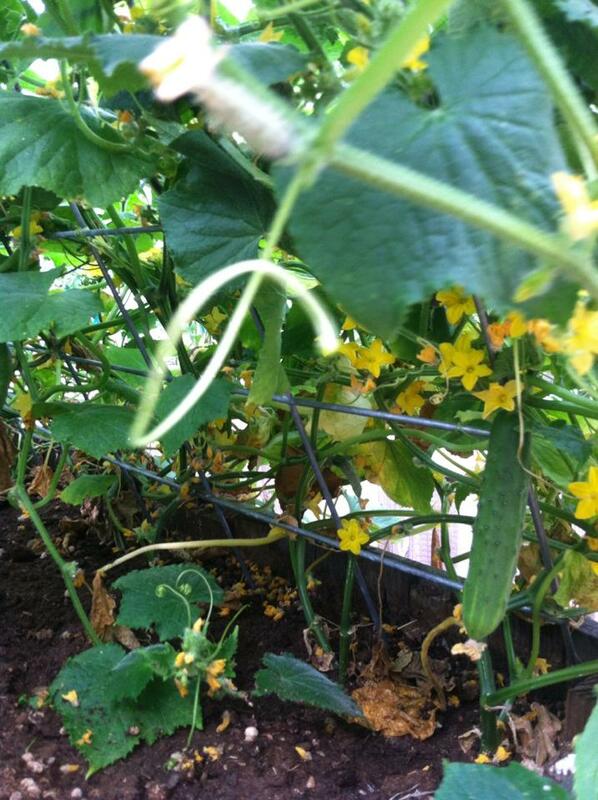 kurstaki) ~ Beneficial bacteria applied as a spray to kill worms & caterpillars. e. Fungus: Serenade Disease Control ~ Provides protection against a broad spectrum of the most common fungal and bacterial garden diseases, yet is completely non-toxic to bees and beneficial insects. It is so safe you can confidently harvest and eat fruits and vegetables the very same day they are treated. a. Garrett Juice ~ Great foliar feed for plants and veggies! b. Dry Molasses ~ Enhances growth and productivity. c. THRIVE An Earth-friendly living microbial treatment with Mycorrhizal fungi for the health of your soil. Safe for use around pets. Available for flowers, vegetables, tomatoes, tree & shrub, and new plants. Before you know it you’ll be reaping what you sow! 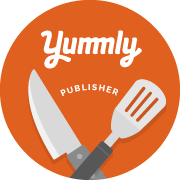 You and your family will enjoy the reward of having fresh vegetables at your fingertips for use in great recipes or just enjoying fresh from the garden! Happy harvesting! I love the beautiful colors of these heirloom tomatoes. 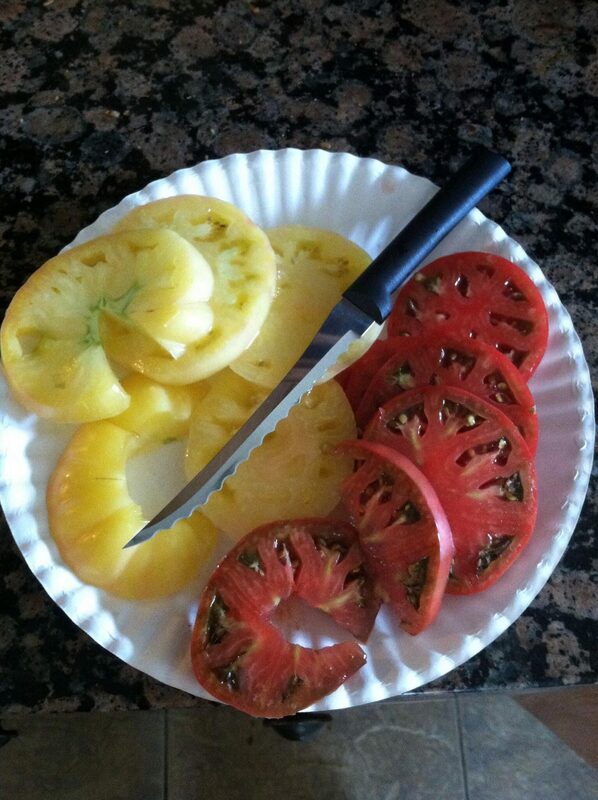 And you wouldn’t believe the taste – there’s nothing like a homegrown tomato! 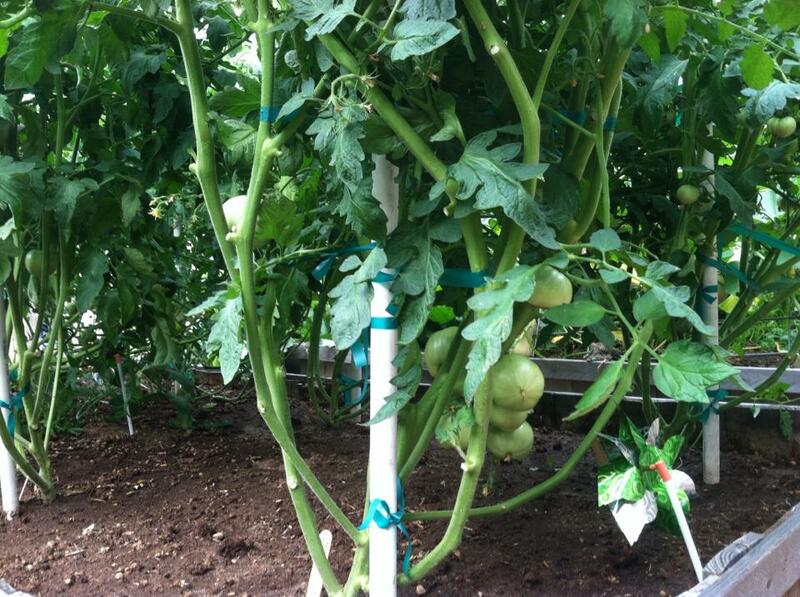 Yes, even the green variety and white variety taste like a ripe tomato! 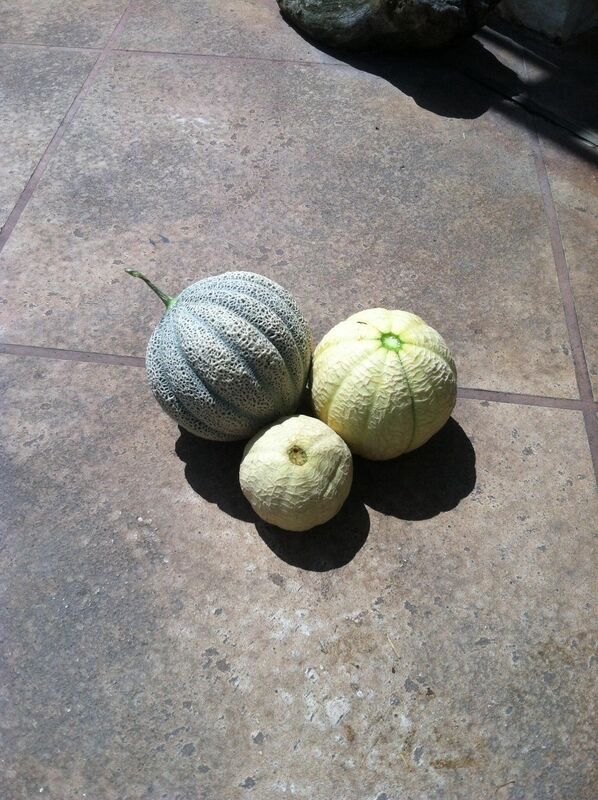 Israel Melons. Our favorite! So sweet, similar to cantaloupe crossed with honeydew with a tropical taste. They are wonderful! 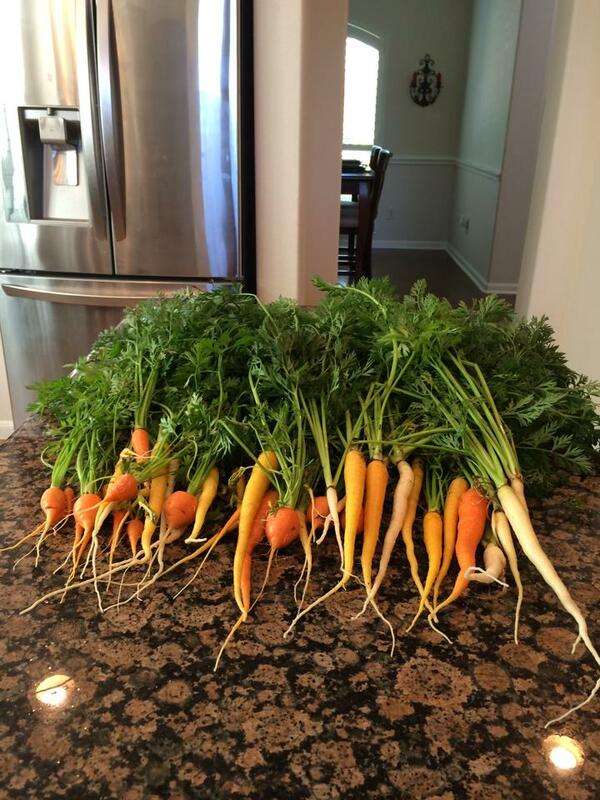 The carrots grew beautifully in the fluffy well-amended soil of the raised beds. 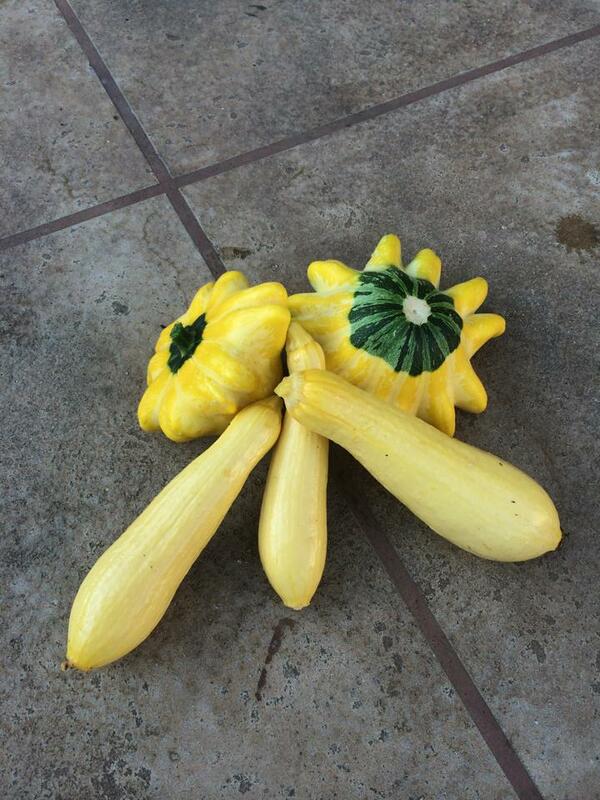 Our favorites were Heirloom Paris Market and Heirloom Danvers Half Long. I hope you’ll try gardening by starting a little at a time. If you have any questions, please feel free to ask in the comments.